Warner Bros. kicked off their debut into home video in the late '70s under their Warner Communications, Inc. video division. These videos were in large gatefold cardboard boxes resembling books carrying the "W" logo above and the "WCI Home Video" banner on VHS and Beta. I don't own any of these yet, but notable titles include the first home video editions of Superman and The Exorcist. Being flimsy cardboard, they're naturally quite hard to come by in great condition. Sometime in 1980, Warner dropped the WCI label, but kept the logo, box style, and adopted the "Warner Home Video" banner. The packaging then made another change in 1981 with the introduction of a uniform standard with a design of varying color, a centered still from the given title on the front, two small stills on the back, and a long synopsis with critical reaction. At first these were in cardboard boxes as before, but plastic "puffy" clamshell cases came into prominence. Warner kept both styles going at random until 1982 when clamshells became their norm. Most of my Warner tape collection is comprised of these and seem to be the most commonly found clamshells in video history, dating from 1981 through 1985. In the last year, the studio adopted the "WB" logo. 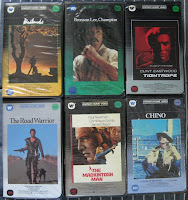 After 1985, Warner slid in the usual (and boring) cardboard slipsleeves commonly associated with VHS. All these are on VHS, except Humanoids from the Deep, The Nesting, and The Pack which are on Betamax. The Mummy (1959), The Hand, and Chino are sealed. There's a good number I still want to find, including The Exorcist, The Amityville Horror, The Town That Dreaded Sundown, Frogs, and Deadly Eyes.